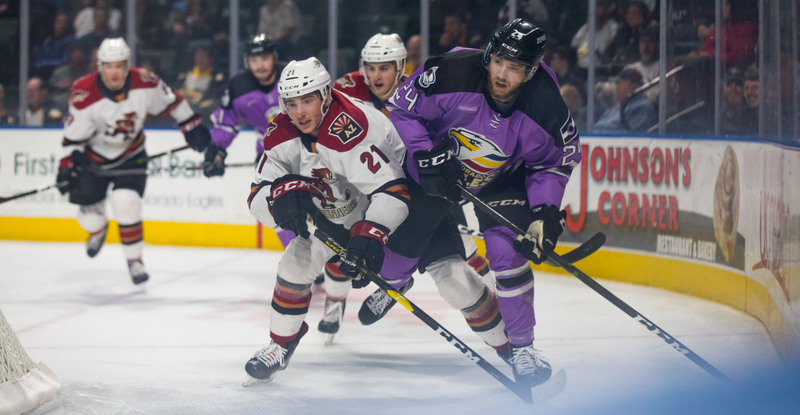 Facing a heavy deficit early on, the Roadrunners found themselves in too deep Friday night against the Colorado Eagles, falling by a 7-3 final at the Budweiser Events Center. Hunter Miska got the call to make his first start since December 29, but was pulled just 11:34 into the game after allowing three goals on nine shots faced. Adin Hill came in for relief of Miska, putting in his first AHL action since November 21. The Eagles would build a 5-0 lead into the early stages of the second period. Michael Bunting got the Roadrunners on the board with just over 16 minutes left to play in the middle frame when he buried a shot from the right circle as the team operated on its second power play of the night. 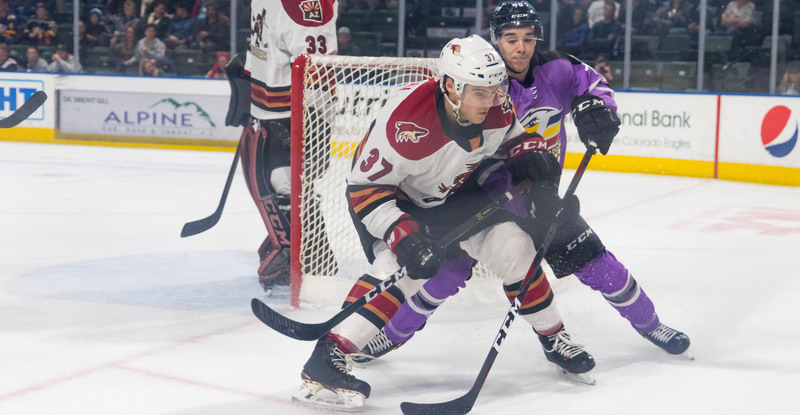 Bunting’s goal, his seventh of the season, was also his first since returning to the Roadrunners from the Arizona Coyotes last week. Just over four minutes into the third, Bunting would capitalize again, beating Pavel Francouz with a move to his backhand after speeding in alone upon intercepting a pass in the defensive zone to register the Roadrunners’ second shorthanded goal of the campaign, cutting the Eagles’ lead to three by making the score 5-2. Colorado responded shortly thereafter to take a 6-2 lead with 13:18 left to play. The Roadrunners struck for their second power play goal with 7:36 remaining in regulation, David Ullstrom depositing a wrist-shot to the top shelf for his seventh goal of the season, cutting the score to 6-3. With 3:26 remaining, the Eagles buried their final goal to take a 7-3 lead, the night’s eventual final score. Burke (2A), Dakota Mermis (2A), and Bunting (2G) each finished the game with multiple points. Hill suffered the loss as the goalie of decision, stopping 26 of the 30 shots he faced in 48:26 of action. The teams will meet again on Saturday night at the Budweiser Events Center, where the puck is scheduled to drop just after 7:05 PM MST.